The second half of Day 2 brought the theme of the conference, “From the Global Agenda to Local Action,” to the forefront, discussing how cities can share best practices to accomplish change, and how diverse stakeholders can coordinate to improve urban mobility. 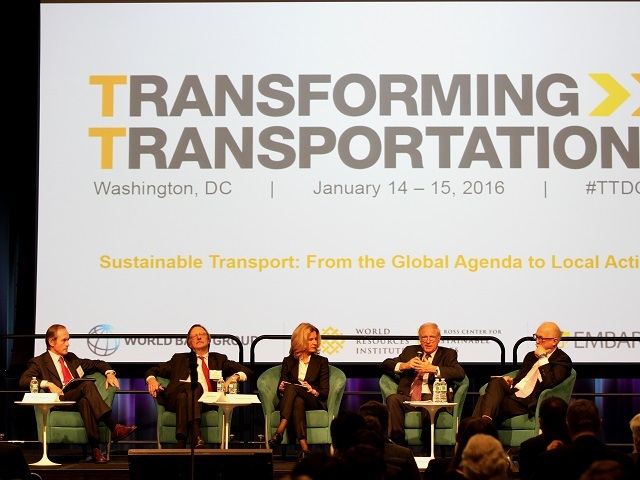 Pierre Guislain, Senior Director of Transport and ICT, World Bank and Holger Dalkmann, EMBARQ Director at WRI Ross Center for Sustainable Cities, closed out Transportation Transformation by noting how much has changed in the past year. Sometimes the best way for cities to garner new ideas is by learning from other urban leaders. Speakers explained that “twinning,” which refers to the formal collaboration between two paired cities, offers an effective model for sharing best practices between cities facing similar problems. During the session, 5 city leaders who have been engaged in twinning partnerships discussed the benefits and barriers of consulting other cities for urban development. Michael Glotz-Richter, Senior Project Manager of Bremen, began the event, detailing the city of Bremen’s partnership with Belo Horizonte. Recalling the initial phases of their twinning meetings, Glotz-Richter joked “It was like a blind date. We were brought together, and it was love at first sight.” Glotz-Richter explained that the two cities’ love of cycling united them, forming the basis of a long term partnership that would benefit both cities. Celio Bouzada, Director of Planning, BHTRANS, Belo Horizonte noted that by 2020, the city plans to have more than 400 kilometers of cycling paths – an aspiration inspired by Bremen. Leaders also highlighted a twinning partnership between Nantes and Agadir. With a long history of collaboration, the cities extended their teamwork into the transport sector in 2006, working together to implement a BRT system in Agadir. The French government agreed to help fund the work on the BRT, investing more than 1 million euros to pilot a BRT line in the Moroccan city. Nicole Rabu, Advisor to Director General at SEMITAN in Nantes, noted that “speaking with people was a key for success” on the project, and allowed both groups to reach a mutual understanding. The final full session of Day 2 brought together four transport experts to reflect over 2015, and express their thoughts on the year ahead. 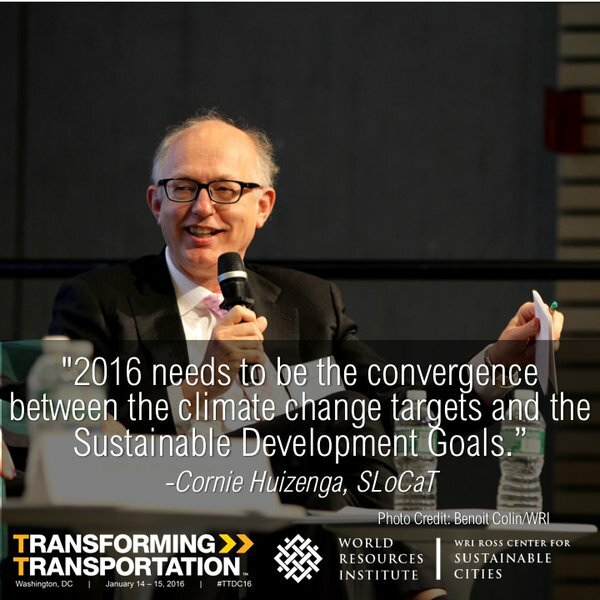 Cornie Huizenga, Secretary-General at SLoCaT noted that for 2016, “The problems are the same, but the solutions need to be different.” Huizenga stressed that we need “disruptive change” instead of quick fixes and low hanging fruit. Indeed, the real change must come from structural overhauls with high levels of ambition, with integration between local and international actors. Jose Luis Irigoyen, Director of Transport and ICT at the World Bank, was optimistic that the deal at COP21 and the Sustainable Development Goals would catalyze change in sustainable transport. However, the real challenge is implementing the necessary changes and ensuring that mechanisms for monitoring and accountability are in place. The speakers also explained their major takeaways from the conference; Alain Flausch, Secretary-General at UITP said “I would take away that every time we are considering the future, we come back to how do we find the brave champion…that will listen to us.” Flausch emphasized that transport experts and participants of the event must go out and work with political officials, harnessing current momentum on climate change to effect change. When doing so, Flausch dared transport planners to “be more bold” in their pursuit of sustainable urban mobility, fighting back against private vehicle ownership and congestion. Finally, Jorge Kogan, Head of the Transport Group at CAF, urged 2016 to be a year that destabilizes the top-down approach to planning and international development. “Mind the gap,” Kogan said, referring to the disparity in transport options between developing and developed countries. Moreover, beyond simply investing in governments and experts to make change, we should also empower societies’ most vulnerable citizens, encouraging them to speak up and inform decision making.